It was on the Grand Canal. It was one of the few places we could find that offered rooms with a terrace. I’m a sucker for balconies. It was reasonably priced considering the above. Check-in for the hotel is listed as 2 PM. Our ferry from Croatia got in a bit early and we ended up arriving at the hotel at 12 PM. 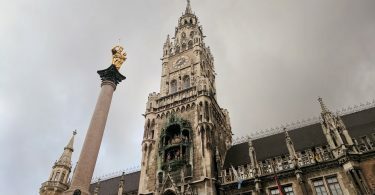 We planned on asking the front desk to hold our luggage until our rooms were ready (we were also traveling with my parents) and wandering out to grab some lunch. 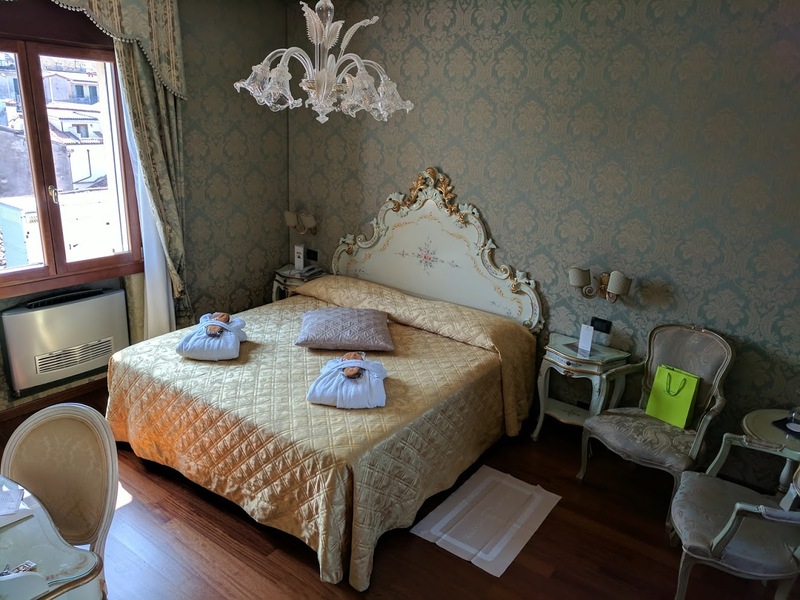 Walking into the hotel- along the famous Grand Canal– across decorative marble floors and past bright pastel yellow accent walls, lined with high wing-back chairs… it gave a feeling of mature (but not tired) opulence, perfect for Venice. 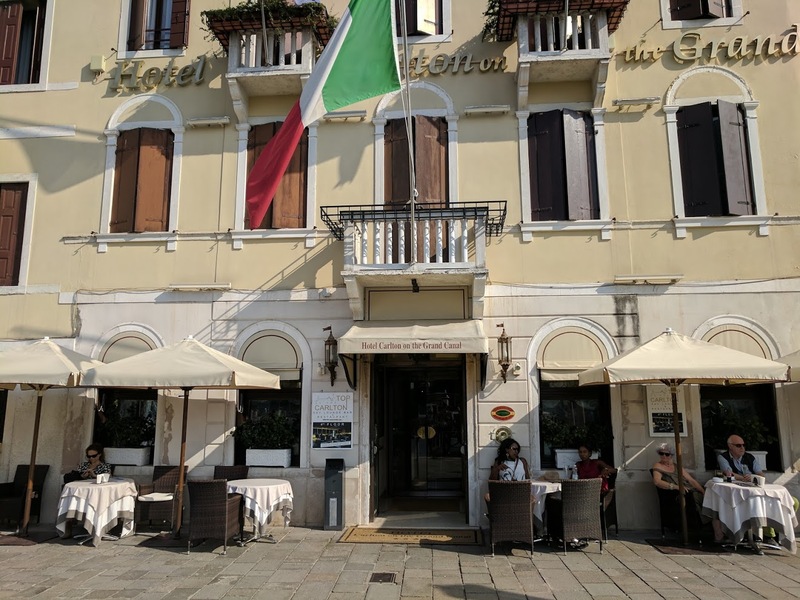 The reception area was filled with English speaking tourists, a quick reminder of the current tourist-packed condition of Venice. A breakfast buffet is provided from 7 AM to 10:30 AM at the La Cupola restaurant. La Cupola Restaurant, on the first floor, is available for lunch and dinner. 24, 48, and 72 hour Vaporetto Water Bus tickets could be purchased at the front desk. Airport transfer tickets for the water and road-going airport buses could also be purchased at the front desk. Cocktails, appetizers, and dinner are available at their Sky Lounge & Restaurant, an open-air terrace overlooking the Grand Canal on the top floor of the hotel. Drinks from the Carlton Cafe are available inside the hotel or outside at one of their eight Canal side tables. We rode the elevator to the top (fourth) floor, where we waited for the hotel bellman who had our keys and bags. The elevator, in old-building fashion, was too small for him to ride with us. After a brief wait he was there to open the door to our room. It was lovely! A small dark hardwood walkway leads us into the bedroom and continued briefly to the bathroom and terrace doors. 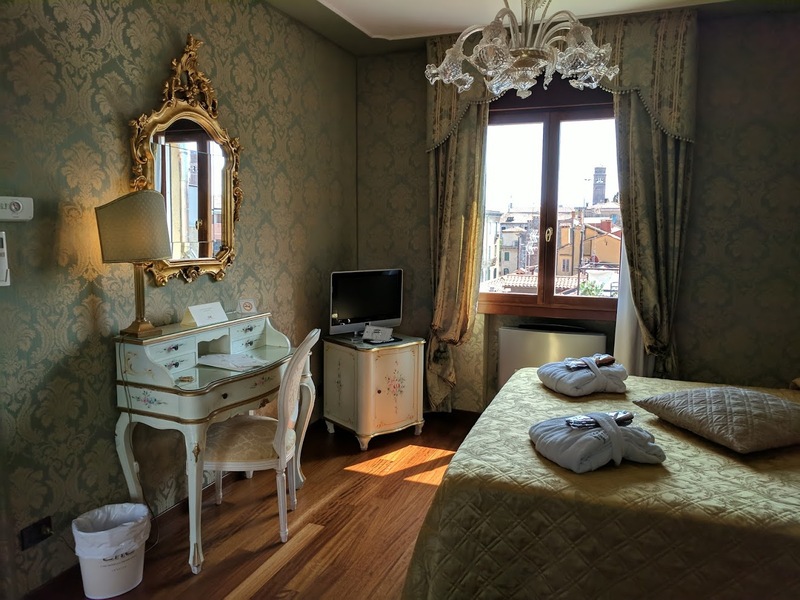 Lots of windows looking out on Venetian rooftops made the room extremely bright and inviting. Robes and slippers awaited us on golden diamond stitched bedding. Me being me, I could only think of one thing, the terrace! 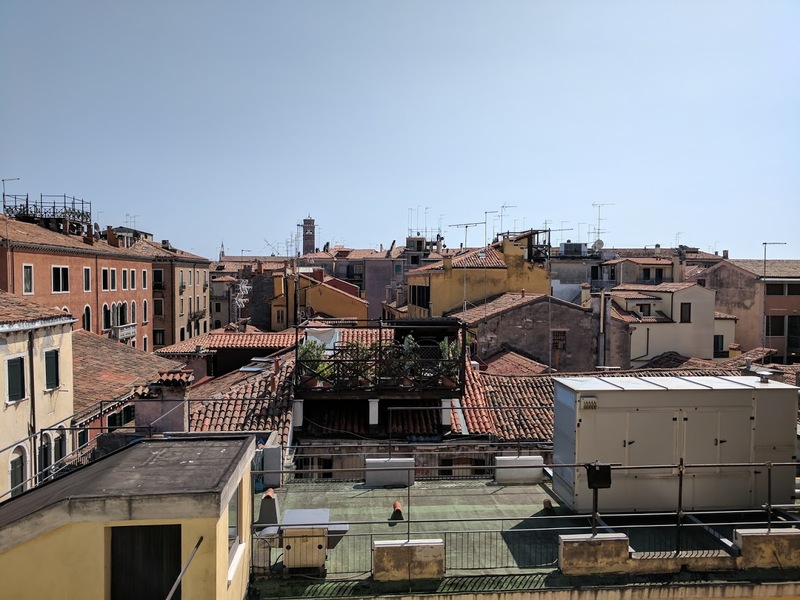 After battling the curtains (the little draw ropes are hard to find), I was able to take in the stretching views of Venice bell towers and and red terracotta rooftops. 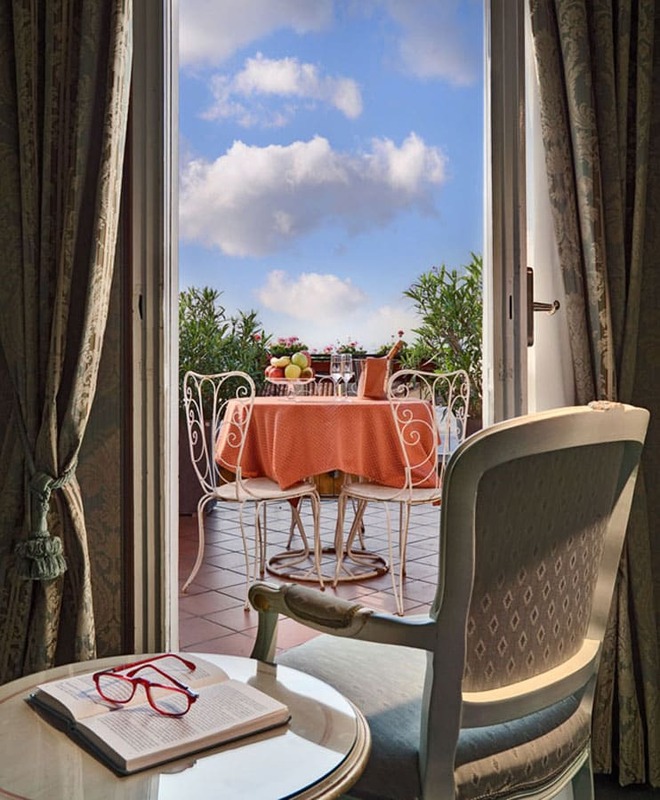 Mind you, we’re fairly certain there is only one junior suite terrace room in the hotel and it does not overlook the Grand Canal- the view is blocked by the front of the hotel and their Sky Lounge. It does overlook some really cute rooftops and offers private seating for their live music, though. If you’re ok with that, you will not be disappointed with the view. The room was very clean. The TV was a bit tricky to get turned on, we thought ours was broken the first night. Side note, they interestingly enough have a “Needs Repair” card which you can fill out and place on the door handle outside your door. The glass shower wall is not set in place. It’s very easy to bump it while showering and get water all over your bathroom floor, which we did several times. 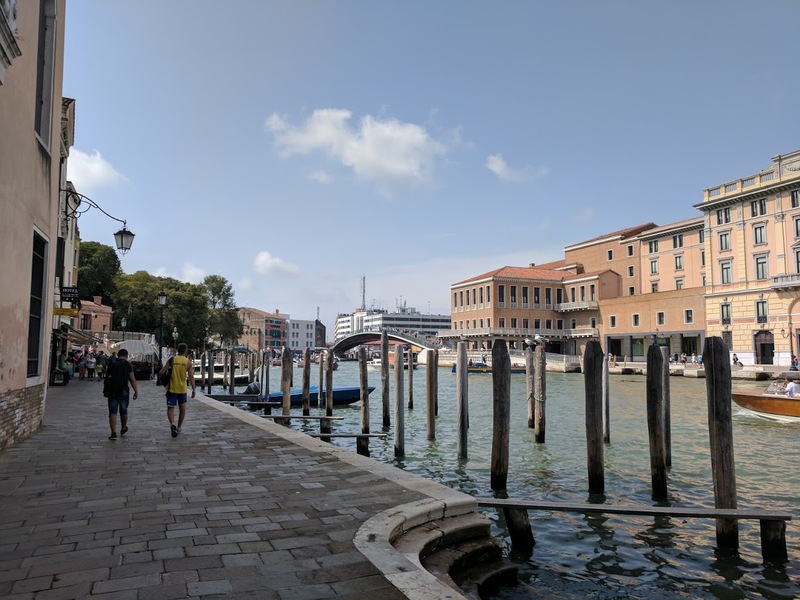 The hotel was just across from the Venezia Santa Lucia Railway Station and the Ferrovia water bus stop for the Vaporetto, making it very easy to get anywhere in Venice. We only ate breakfast at the hotel, so we can only speak to their breakfast spread. They offered up a buffet of pastries, slightly runny eggs, crisp bacon, fresh fruits, and a few kinds of cereal. All of this was definitely enough to get your day going and keep you filled through until lunch. During the summer months, the Sky Lounge can get very hot during the afternoon. If you can snag a table with an umbrella, definitely do that. Once the sun goes down there are more people and is more difficult to get a table with a good view of the Grand Canal. The staff was friendly, although professional, and very accommodating. 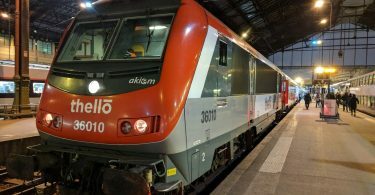 The only issue we had with the staff was on our departure day. About three hours before our scheduled checkout, we were sitting out on the terrace when we heard our door open. Two hotel staff members came in and were randomly measuring a storage chest that was in the room’s walkway. They did not let us know about this ahead of time and they didn’t seem to think anything of it. They were in and out in about 10 minutes, but still… it was odd. 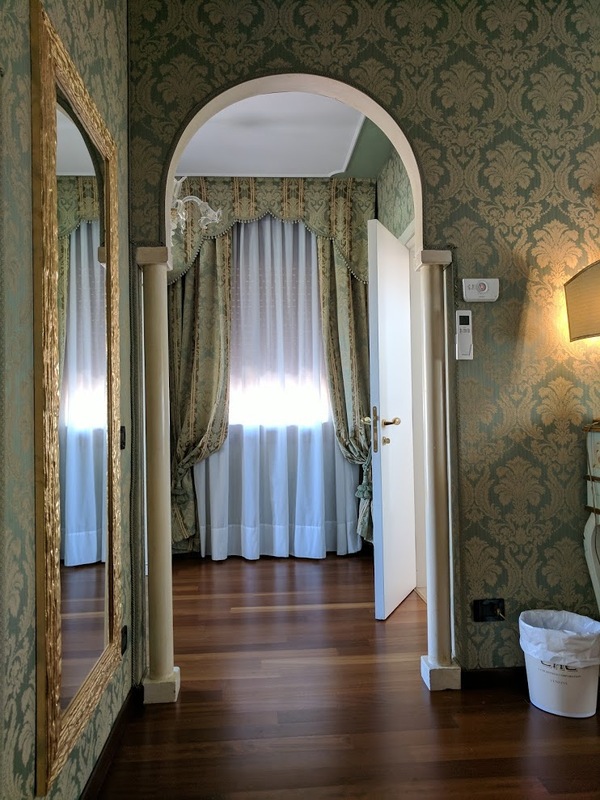 If you don’t need a view of the Grand Canal, spring for the junior suite with panoramic terrace! Other members of our party had views of the Canal, but much smaller rooms. 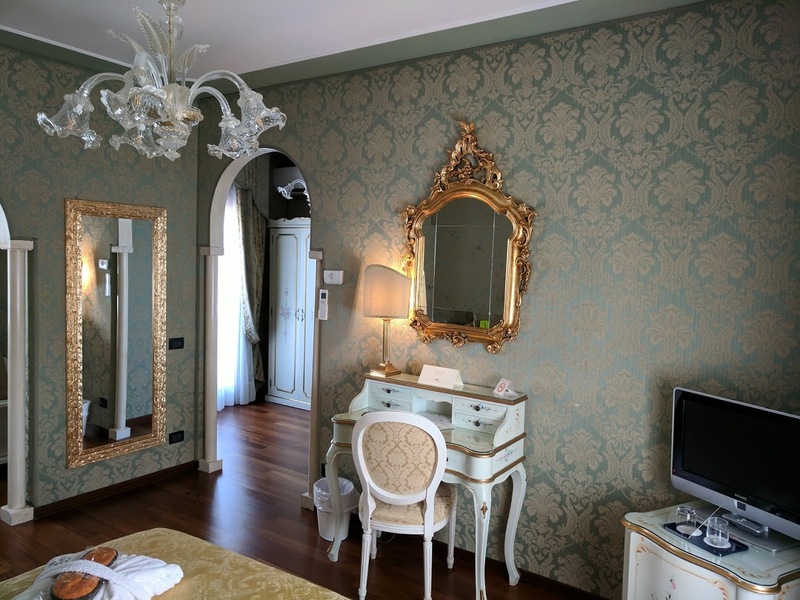 There is a junior suite that overlooks the canal, but no terrace. 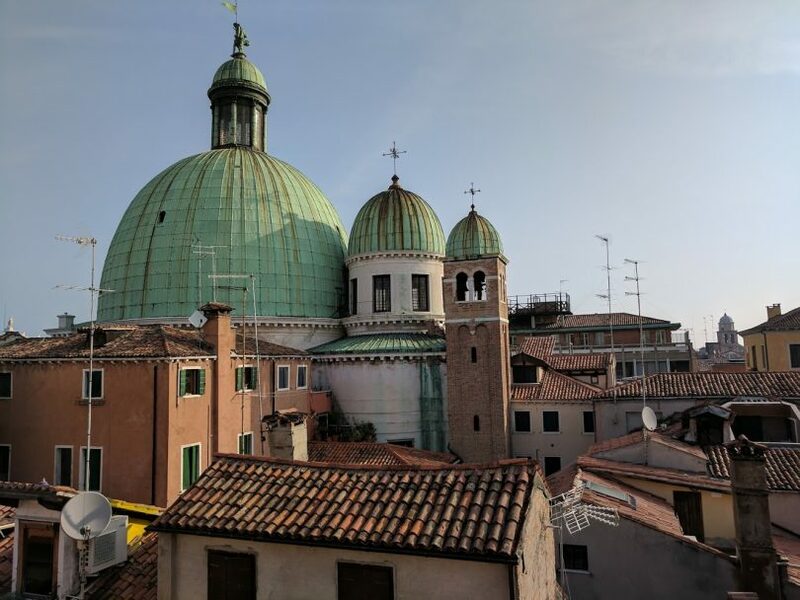 If you’d like your own private little nook to sit on and take in the rooftops and sounds of Venice, this was perfect.